Let's make it simple: "Live Chronicles" is to the eighties what "Space Ritual" is to the seventies: HAWKWIND's best live release of the decade. Whereas the 70's performance is mainly stoner, this one is mainly space metal. The set-list features tracks from "In Search of Space", "Warrior on the Edge of Time" and their 80's albums, especially - as the title suggests - their last opus at this time, "The Chronicle Of The Black Sword". Furthermore, like "Space Ritual" and other concerts, it also contains a few previously unreleased compositions, as well as - unfortunately - spoken ambient transitions, however shorter than usual, so it does not matter much. The live versions of the studio songs are all good: space metal oriented and often with additional sci-fi sonorities. In particular, "Dragons And Fables" is better than the original studio version, with a more epic melody variation and spacey keyboards. The renditions of the 70's iconic tracks "Master Of The Universe" and "Conjuration Of Magnu / Magnu" are heavier, especially "Magnu" which is shortened and whose middle-eastern arrangements are replaced by distorted guitars. This is the eighties now... The peaceful "Zarozinia" is enhanced by a dreamy synthesizer solo. Instead of the original song, "Dust of Time" is in fact a nice short metal-ized instrumental reinterpretation of the studio version. Concerning the previously unreleased tracks, they're overall quite interesting. The soft space ballad "Dreaming City" is not great, but enjoyable. "Wizards Of Pan Tang" is an epic piece in a style similar to "Dragons And Fables", while the cool space metal song "The Dark Lords" displays a dark electronic ambiance. This double live album is a good rendition of the band's best passages of the 1981-1985 period. Furthermore, it's nice to hear the 70's classics reinterpreted the heavy metal way. Although different from "Space Ritual", attending the live performance with Elric brandishing his swords should have been also great. 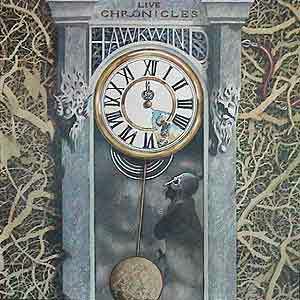 Essential for all 80's HAWKWIND fans, "Live Chronicles" is simply one of their best releases from this decade!